Located in the newly opened Spring, Kuching’s largest, cool mall at the moment. Read more about the Spring opening and pics here. From itil training that one receives in any mcsa boot camp, one learns enough to know that being an mcp means constant studying for the rest of your life. There will always be a ccna exam or the more advanced ccnp exam coming up one week or the other. Even with mcse behind you, you cannot get rid of the it training, ever. I always wanted to visit Kuching, but now, with the Switch Apple Store, I have another reason to do so. It looks great! I visited one of their stores in Penang. Great people. Very friendly and very knowledgeable. I heard this store will be running by Kuchingites. Let’s hope our folks are as good as them in Penang. 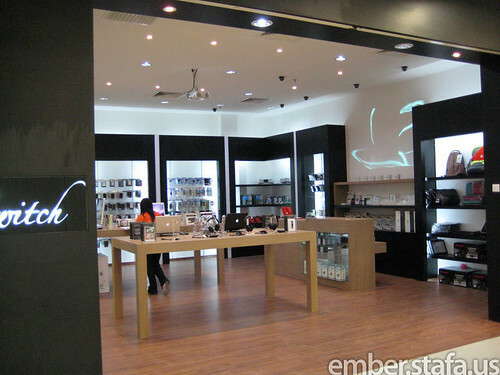 Apple Store in Kuching? Well this is not new though. Perhaps, it has been long ago that Kuching has an Apple Authorised Reseller which somehow offers the same as any Apple Store nationwide… that called ITFusion. Just go to http://www.itfusion.com.my to find out more. Whats the different?? Let just say, ITFusion is run, own and support by local Kuchingites. Switch… well its belong to Penang’s end.. pretty much franchise. Yeah but that wasn’t in a mall, so not so exposed to possible switchers..but thanks for the website link…another great blog to read about apple stuffs. hai, may i know what is the price for Mac mini 2.26GHz? Cos i stay at Samarahan, don’t have transport to go there to get more infor. Yesterday I bought MacBook pro from the switch, I am now encounter problems in setting up my powercadd program . My cadd works on OXS whereas the laptop-i7. Is there anyway to down grade the laptop to oxs? Your OS should be Snow Leopard right? If you wanna downgrade, you gotta get the other OS installer. I’m not sure they are still available now.